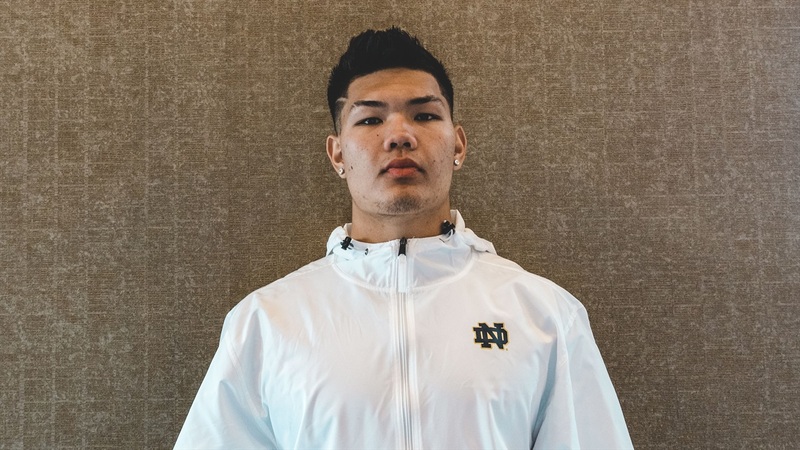 2020 St. Louis (Hawaii) defensive end Jordan Botelho‍ made the long journey out to South Bend this weekend for an official visit to Notre Dame. The 6-foot-3, 230-pounder was able to maximize his 48 hours at Notre Dame along with his parents and they left South Bend knowing it could be a home for the four-star prospect. Notre Dame is recruiting the Botelho to play the Drop position, so it wasn’t a total surprise to hear fellow Hawaii native Myron Tagovailoa-Amosa hosted him for the weekend. Now, it might seem like an obvious move for Tagovailoa-Amosa to host Botelho, but the St. Louis star had previously told Irish Sports Daily that playing with those from the Aloha State in college wasn’t much of a factor in his decision. In addition to seeing a close bond within the team, Botelho also got plenty of time around the Notre Dame staff as it was a light visitor weekend. Head coach Brian Kelly was able to meet with Botelho and his family and they were very impressed with his personality. Defensive line coach Mike Elston also spent quality time with Botelho and the two hit the film room while on campus. Elston was able to show Botelho how he’d fit into the defense and how both sides already did similar things. Area recruiter Brian Polian has been a crucial part of Botelho’s recruitment and this weekend only brought them closer. Notre Dame knocked it out of the park with relationships, but the Irish also hit a home run with academics. Botelho will now look to schedule visits to a few other programs before he makes his decision. LSU, Nebraska, Ohio State, Oregon, Tennessee and Washington will all be under consideration for official visits moving forward. But, Botelho admitted committing to Notre Dame did cross his mind while on campus this weekend. “My parents really like it,” Botelho said of potentially committing to the Irish. “We definitely talked about it. This is my first official visit and my first time being on this side. I want to check out the other schools before I make a decision.